A graduate-level textbook and survey of the recent results on analysis and geometry of differential equations in the real and complex domain. The book includes self-contained, sometimes simplified demonstrations of several fundamental results. It explores in a systematic way the algebraic decidability of local classification problems, rigidity of holomorphic foliations, etc. 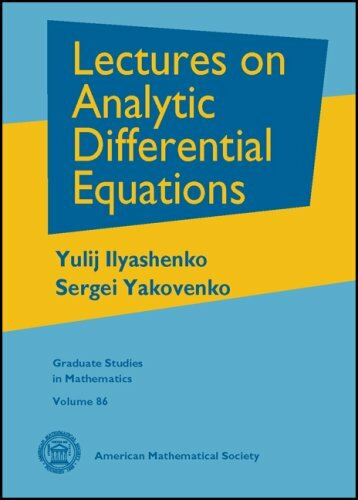 This book, together with the linked YouTube videos, reviews a first course on differential equations. The purpose is to help students prepare for their exams. Theory is summarized, and the solutions of questions are demonstrated in YouTube videos. From the table of contents: Pendulum and MatLab; First Order Equations; Second Order Linear Equations; Difference Equations; Matrix Differential Equations; Weighted String; Quantum Harmonic Oscillator; Laplace Transform, etc. From the table of contents: First Order Differential Equations; Linear Differential Equations; Second Order Linear Differential Equations; Linear Differential Systems; Power Series Solutions; Fundamental Theory of Ordinary Differential Equations. The intent of this set of notes is to present several of the important existence theorems for solutions of various types of problems associated with differential equations and provide qualitative and quantitative descriptions of solutions.